Sefram works with 4 continents. Please check "International" on the website to see our representative over the world. 2013: SEFRAM launches new measurement board for Recorders, new programmable power supplies and several T&M products. 2011: SEFRAM launches the new DAS20/40 family of portable recorders. 2010: SEFRAM launches a new TV Meters family dedicated to HD TV with first models on worldwide market able to display HD programs and decode all digital sounds. 2009: new products in T&M, with new DC electronic loads, new spectrum analysers and new TV Meters. 2008: new products in T&M (more than 10) and new recorder's boards and options. The website is totally rebuilt. 2007: a new T&M catalogue with more than 20 news products! 2006: a new family of recorders 8440, DAS600 and DAS1400 - from 6 to 36 channels. 2005: a new family of Field Strength meters (7829B, 7833C, 7834B). 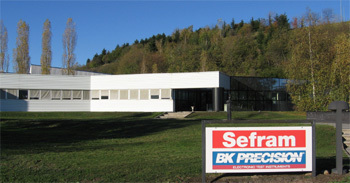 November 2004 : SEFRAM becomes the European plateform for BK Precision . 1947 : fundation of Sefram. Development and specialization in the field of recorders. "Test & Measurement" Division in Schlumberger, that includes the development and manufacturing of oscilloscopes, frequency counters, generators,... from Schlumberger and the recorders from Sefram. 1995 : acquisition of Sefram Instruments & Systèmes by the G.E.Mesure group. 1997 : ISO 9001accreditation. Development of a new 16 channels thermal recorder (8416). Renewal of the Test & Measurement products, with the introduction of 40 new products. 1998 : introduction of a new TV analyser, for digital and analog cable distribution and terrestrial TV and Internet applications (SEFRAM 7832). Transfer of Elditest activity to Sefram division. 1999 : introduction of a new paperless recorder 4/8/12/16 channels (DAS1000). Introduction of a new family of mini-dataloggers. 2001: introduction of more than 10 new T&M products. The datalogger's family is enhanced with 3 new models. 2003: ISO9001 certification renewal with V2000 ISO. Introduction of DAS1200 and DAS400, paperless recorders. More than 10 new products for Test & Measurements. 2004: a new family of Field Strength meters (7802, 7803, 7804, 7805). ELDITEST provides a complete family of test and measurement accessories designed to meet the real needs of engineers, designers and technicians.